I haven’t done a lunchbox for a little while, partly because out of laziness I’ve not been taking a packed lunch every day and have made quite a few trips to Pret/EAT at lunchtime of late, but also because when I have been making packed lunches they’ve been a bit repetitive and the same as lunches I’ve featured on here before. However, I am now firmly back on the packed lunch wagon and determined to come up with some new, interesting and tasty ideas. The summer’s approaching which means there’s some different seasonal ingredients knocking about in the fridge and different more exciting leftovers to be incorporated into salads and wraps etc. The weekend, I’m sure you noticed, was perfect barbecue weather. I love a barbecue, but what’s really handy about them is there’s often some nice tasty leftovers hovering in the fridge for the next couple of days. Grilled chicken, sausages sliced up and burgers crumbled up are ideal for mixing into salads, pastas, cous cous and wraps. 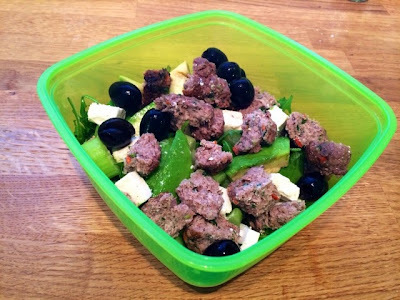 I crumbled up a couple of leftover lamb koftas from my weekend BBQ and added them to a Greek style salad for my Monday lunch and added a dollop of houmous to mix through as a sort of dressing. The result was a very tasty Mediterranean packed lunch.